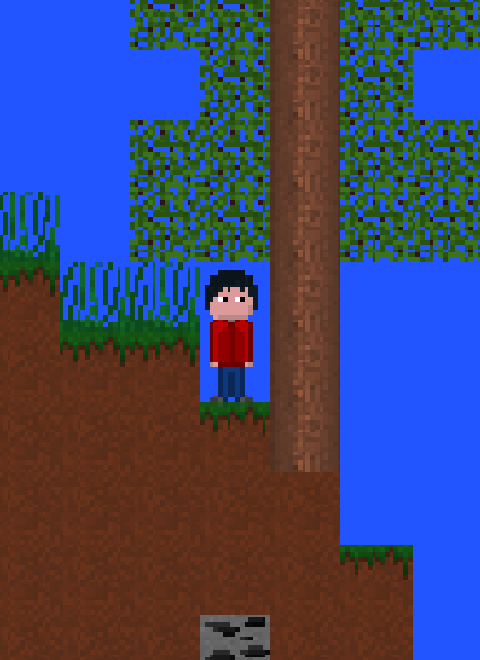 Mine Blocks 2 is a 2D block-based adventure game. While it can be compared to games such as Terraria and Minecraft, it has it's own premise and gameplay. In this game, you are in a vast (infinite) world, forced to conquer nature in order to live. Gather the resources hidden within the planet to create and do anything out of the unlimited possibilities. The game modes will include survival, creative, story mode, and multiplayer. Mine Blocks 2 - 0.7 update! Walk on forever without ever hitting a border in this brand new world generator! There are dozens of new blocks, and a total of 11 biomes to explore. The world is also really deep, so there is plenty caves to mine in. You can find bonus chests in caves filled with loot! No longer can you see all the blocks at once - Mine Blocks 2 now has an awesome lighting engine! It supports sunlight, moonlight, and differently colored light sources (lava, torches, glowing flowers, etc). In the settings you can choose what pixelation style you like the best. It looks so nice! Inventory - crafting, cooking, chest...ing! You can now open your inventory and move things around! The crafting interface is unique, but very simple - combine different items to create new things! The campfire was added to introduce cooking and smelting. Chests were also added to help when your inventory gets full of blocks and items. Many new blocks and items! With the introduction of infinite worlds and an inventory/crafting system, there MUST be a lot of new blocks and items! Well there is! The full list is in the changelog below. Are you up for the challenge to make the biggest, most expensive survival house ever!? Definitely read the list below with all the features! - A boulder, because why not! I hope you have a lot of fun! And please have happy April Fools' Day! Hey Zanzlanz, you should introduce a bed! Its boring to wait too many minutes to the other day. Monster too. They make the game more fun. :) Those are the things u need to add first, to gameplay be better. If u asking urself what u will add first, add those things I say'd to u. Add those things first, and then the others :) Im waiting for that! No worries, I have plans! I want this to be a game that I genuinely want to play too. That said, the game engine is the most important thing to focus on right now - so AI and multiplayer will be first on the list (monsters, yes!). Beds and other blocks & items are secondary, but will be introduced near the end of each update cycle. I actually had a time limit last update, so some of the important items got left out, unfortunately. But after the engine looks all good, I want this game to have a ridiculous amount of good content. Recipes include the campfire, cobblestone, and stone tools. That's okay! Mine Blocks 2 will have support for multiple languages. At the very beginning, I'm supporting English, Spanish, Portuguese, and German. Assuming the glyphs all work in the font, that should be no problem in this game. I'll need to find a Russian translator first, which I'll start working on probably near the end of alpha or during beta.